Light Table is Open Source — this matters because these experiments in semantic interactivity inform technical UIs of the future, and the more ubiquitous this code is then the more effect it can have and the sooner we can have the future. The Six Things That Make Stories Go Viral Will Amaze and Astound You (New Yorker) — Berger and Milkman found that two features predictably determined an article’s success: how positive its message was and how much it excited its reader. The obvious part is that we develop immunity to things that catch our attention: our brains are well-developed systems for filtering, and the only constant is that advertisers will need novelty. The Story of Holacracy’s Founder (Quartz) — background on the interesting flat organisation culture system that’s gaining traction in startups. Why The Banner Ad is Heroic — enough to make Dave Eggers cry. Advertising triumphalism rampant. Udacity/Thrun Profile — A student taking college algebra in person was 52% more likely to pass than one taking a Udacity class, making the $150 price tag–roughly one-third the normal in-state tuition–seem like something less than a bargain. In which Udacity pivots to hiring-sponsored workforce training and the new educational revolution looks remarkably like sponsored content. Amazing is Building Substations (GigaOm) — the company even has firmware engineers whose job it is to rewrite the archaic code that normally runs on the switchgear designed to control the flow of power to electricity infrastructure. Pretty sure that wasn’t a line item in the pitch deck for “the first Internet bookstore”. Panoramic Images — throw the camera in the air, get a 360×360 image from 36 2-megapixel lenses. Not sure that throwing was previously a recognised UI gesture. Ten Rules of the Internet (Anil Dash) — they’re all candidates for becoming “Dash’s Law”. I like this one the most: When a company or industry is facing changes to its business due to technology, it will argue against the need for change based on the moral importance of its work, rather than trying to understand the social underpinnings. Data Storage by Vertical (Quartz) — The US alone is home to 898 exabytes (1 EB = 1 billion gigabytes)—nearly a third of the global total. By contrast, Western Europe has 19% and China has 13%. Legally, much of that data itself is property of the consumers or companies who generate it, and licensed to companies that are responsible for it. And in the US—a digital universe of 898 exabytes (1 EB = 1 billion gigabytes)—companies have some kind of liability or responsibility for 77% of all that data. x-OSC — a wireless I/O board that provides just about any software with access to 32 high-performance analogue/digital channels via OSC messages over WiFi. There is no user programmable firmware and no software or drivers to install making x-OSC immediately compatible with any WiFi-enabled platform. All internal settings can be adjusted using any web browser. Google Experimenting with Encrypting Google Drive (CNet) — If that’s the case, a government agency serving a search warrant or subpoena on Google would be unable to obtain the unencrypted plain text of customer files. But the government might be able to convince a judge to grant a wiretap order, forcing Google to intercept and divulge the user’s login information the next time the user types it in. 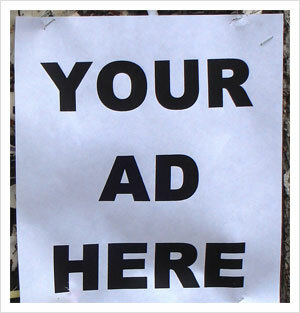 Advertising depends on the service provider being able to read your data. Either your Drive’s contents aren’t valuable to Google advertising, or it won’t be a host-resistant encryption process. Metaphor Identification in Large Texts Corpora (PLOSone) — The paper presents the most comprehensive study of metaphor identification in terms of scope of metaphorical phrases and annotated corpora size. Algorithms’ performance in identifying linguistic phrases as metaphorical or literal has been compared to human judgment. Overall, the algorithms outperform the state-of-the-art algorithm with 71% precision and 27% averaged improvement in prediction over the base-rate of metaphors in the corpus. Inside the South Korean Cyber Attack (Ars Technica) — about thirty minutes after the broadcasters’ networks went down, the network of Korea Gas Corporation also suffered a roughly two-hour outage, as all 10 of its routed networks apparently went offline. Three of Shinhan Bank’s networks dropped offline as well [...] Given the relative simplicity of the code (despite its Roman military references), the malware could have been written by anyone. BotNet Racking Up Ad Impressions — observed the Chameleon botnet targeting a cluster of at least 202 websites. 14 billion ad impressions are served across these 202 websites per month. The botnet accounts for at least 9 billion of these ad impressions. At least 7 million distinct ad-exchange cookies are associated with the botnet per month. Advertisers are currently paying $0.69 CPM on average to serve display ad impressions to the botnet. Google’s Help for Hacked Webmasters — what it says. 14 Lousy Web Design Trends Making a Comeback Thanks to HTML 5 — “mystery meat icons” a pet bugbear of mine. The Human Microbiome 101 (SlideShare) — SciFoo alum Jonathan Eisen’s talk. Informative, but super-notable for “complexity is astonishing, massive risk for false positive associations”. Remember this the next time your Big Data Scientist (aka kid with R) tells you one surprising variable predicts 66% of anything. I wish I had the audio from this talk! This week, I found that one of my Facebook updates received significantly more attention that others I’ve posted. 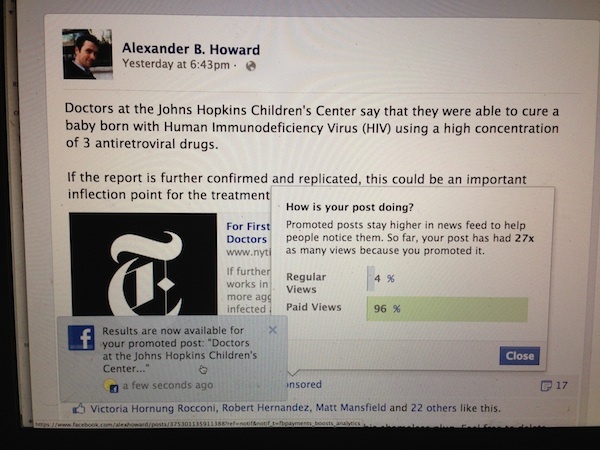 On the one hand, it was a share of an important New York Times story focusing on the first time a baby was cured of HIV. But I discovered something that went beyond the story itself: someone who was not my friend had paid to sponsor one of my posts. According to Facebook, the promoted post had 27 times as many views because it was sponsored this way, with 96% of the views coming through the sponsored version. When I started to investigate what had happened, I learned that I’d missed some relevant news last month. 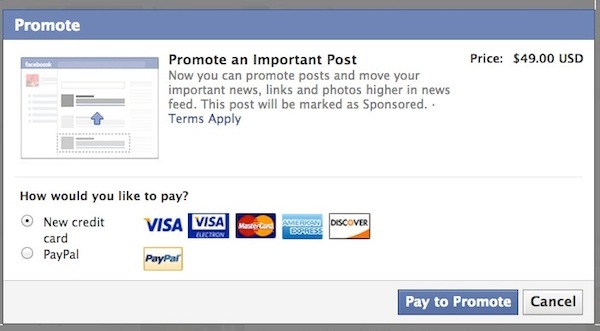 Facebook had announced that users would be able to promote the posts of friends. My situation, however, was clearly different: Christine Harris, the sponsor of my post, is not my friend. When I followed up with Elisabeth Diana, Facebook’s advertising communications manager, she said this was part of the cross-promote feature that Facebook rolled out. If a reporter posts a public update to his followers on Facebook, Diana explained to me in an email, that update can be promoted and “boosted” to the reporter’s friends. While I couldn’t find Harris on Facebook, Diana said with “some certainty” that she was my follower, “in order to have seen your content.” Harris definitely isn’t my friend, and while she may well be one of my followers, I have no way to search them to determine whether that’s so. If that happens, the sponsored post will then be boosted only to friends of its author, as opposed to an entire network of followers, said Diana. In the United States, she said that will cost about $7. If this is broadly rolled out, it will be interesting to see if PR companies or news outlets quietly opt to boost stories. What this all seems to herald is a broader move where getting seen on Facebook will depend much more upon your willingness to pay for it. This is, of course, the dynamic that has long existed on radio and television, unless you can earn “free media” coverage by being newsworthy. Given the recent kerfluffle over the cost of sharing on Facebook and criticism of the Facebook newsfeed, issues around algorithmic transparency only seem to be growing. While Facebook posted a “fact check” in response to Nick Bilton’s New York Times column, arguing that “overall engagement on posts from people with followers has gone up 34% year over year,” my experience on the platform matches his: even with nearly 100,000 subscribers, my updates aren’t receiving anywhere close to as much engagement as they did before last November. Given the reactions I’ve seen to his column, I believe that Bilton speaks for many journalists and others who have turned on subscribers, along with quite a few Page owners. What we see on Facebook is now driven not just by what our friends and family share but how we and others respond to it, as interpreted by algorithms, along with our interests, expressed by Likes, and the social networking giant’s need to make money. I remember quite clearly when this shift began, on November 3, 2012. WolframAlpha analytics told me that an update with a screencap and annotation of Facebook’s prompt to “pay to promote” received the most comments of any picture in 2012. My feeling last November was that paid promotions would result in my updates becoming deprecated in the newsfeeds of others. Feelings, however, have to be balanced with data. Recent research suggests that, like most users, I have underestimated the audience size for my posts. A new study (PDF) by the human-computer interaction group at Stanford University’s computer science department and Facebook’s data science team found that a median Facebook user reaches 60% of his or her friends over the course of a month. I’m not sure if making public updates sponsorable will fundamentally change how we use or experience the world’s biggest social network. Will having followers promote posts degrade your relationships with friends or your interactions with them? Does it create an incentive to be nicer to them? Perhaps the latter, but the rest of it seems uncertain. What does seem clear is that, over the past five months, Facebook users have been seeing fewer updates from friends and more content targeted to their “Likes.” This now include updates containing links or ads regarding products, services, causes or politicians that their friends “Like” elsewhere online. Given that Facebook is a public company that provides a free, advertising-supported product and needs to grow its revenues, these changes aren’t surprising. That said, these changes feel like one more step away from the clean, uncluttered network I joined in 2007 to privately share details about my life with friends and family. This documentary by Jason Cohn and Bill Jersey celebrates a unique kind of American creativity. Charles Eames, in underacknowledged partnership with his artist wife, Ray Eames, created a design studio in the mid-20th century in Venice, California. It was not merely a question of their classic Eames chair. They worked in almost every field of art, architecture and design; acting like an ad agency, they accepted commissions from big corporations like IBM to produce idiosyncratic promotional films that humanised their sponsors and look now like the most earnest but entertaining instructional movies liable to be shown in US high schools. The most celebrated of these is Powers of Ten (1968), a 9-minute animation about relative scale starting with an overhead shot of a sunbathing couple, zooming out progressively into space and then back into a micro-cosmos of molecules and atoms – it brilliantly anticipates Google Earth. Eames's spirit lives on in the careers of Bill Gates and the late Steve Jobs. The Most Important Social Network: GitHub — I suspect that GitHub’s servers now contain the world’s largest corpus of commentary around intellectual production. This post originally appeared on Joe Wikert's Publishing 2020 Blog ("Why Advertising Could Become Amazon's Knockout Punch"). This version has been lightly edited. It all started harmlessly enough with Amazon's Kindle with Special Offers. That's the cheaper Kindle that displays ads when the device is in sleep mode or at the bottom of the screen when paging through the owner's catalog of books. It is very unobtrusive and, since it lowered the price of the device, has made that Kindle an extremely popular device. Now there are rumors that Amazon is selling ad space on the Kindle Fire's welcome screen. That sounds pretty reasonable, too, as it's a simple way for Amazon to drive a bit of additional income that's pure profit for them. Given that Amazon's goal is to offer customers the lowest prices on everything, what's the next logical step? How about even lower prices on ebooks where Amazon starts making money on in-book ads? Think Google AdWords, built right into the book. Of course, Amazon won't want to use Google's platform. They'll use their own so they keep 100% of the revenue. The changes the DOJ is requiring for the agency model means a retailer can't sell ebooks at a loss, but they can still sell them for no profit, or break even. In other words, the 30% the retailer would keep on an agency ebook sale can be passed along to the customer as a 30% discount on the list price, but that's as deep a discount as that retailer can offer. The rules are different with the wholesale model. Amazon already loses money on sales of many wholesale-model ebooks. Let's talk about a hypothetical wholesale model title with a digital list price of $25. Amazon is required to pay the publisher roughly half that price, or about $12.50 for every copy sold, but that ebook might be one of the many that are listed at $9.99 for the Kindle. So every time Amazon sells a copy, they lose $2.51 ($12.50 minus $9.99). Amazon has deep enough pockets to continue doing this, though, so they're quite comfortable losing money and building market share. So, what's preventing Amazon from taking an even bigger loss and selling that ebook for $4.99 or $0.99 instead? In the wholesale model world, the answer to that question is: "nothing is preventing them from doing that." And if selling ebooks at a loss for $9.99 makes sense, especially when it comes to building market share, why doesn't it also make sense to sell them at $4.99, $0.99 or even free for some period of time? It probably depends on how much pain Amazon wants to inflict on other retailers and how much attention they're willing to call to themselves for predatory pricing. Make no mistake about the fact that Amazon would love to see ebook pricing approach zero. That's right. Zero. That might seem outlandish, but isn't that exactly what they're doing with their Kindle Owner's Lending Library program? Now you can read ebooks for free as part of your Prime membership. The cost of Prime didn't go up, so they've essentially made the consumer price of those ebooks zero. Why wouldn't they take the same approach with in-book advertising? At some point in the not-too-distant future, I believe we'll see ebooks on Amazon at fire-sale prices. I'm not just talking about self-published titles or books nobody wants. I'll bet this happens with some bestsellers and midlist titles. Amazon will make a big deal out of it and note how these cheaper prices are only available through Amazon's in-book advertising program. Maybe they'll still offer the ad-free editions at the higher prices, but you can bet they'll make the ad-subsidized editions irresistible. Remember that they can only do this for books in the wholesale model. But quite a few publishers use the wholesale model, so the list opportunities are enormous. And as Amazon builds momentum with this, they'll also build a very strong advertising platform. One that could conceivably compete with Google AdWords outside of ebooks, too. Publishers and authors won't suffer as long as Amazon still has to pay the full wholesale discount price. Other ebook retailers will, though. Imagine B&N trying to compete if a large portion of Amazon's ebook list drops from $9.99 to $4.99 or less. Even with Microsoft's cash injection, B&N simply doesn't have deep enough pockets to compete on losses like this, at least not for very long. At the same time, Amazon will likely tell publishers the only way they can compete is by significantly lowering their ebook list prices. They'll have the data to show how sales went up dramatically when consumer prices dropped to $4.99 or less. I wouldn't be surprised if Amazon would give preferential treatment to publishers who agree to lower their list prices (e.g., more promotions, better visibility, etc.). By the time all that happens, Amazon will probably have more than 90% of the ebook market and a nice chunk of their ebook list that no longer has to be sold at a loss. And oh, let's not forget about the wonderful in-book advertising platform they'll have built buy then. That's an advertising revenue stream that Amazon would not have to share with publishers or authors. That might be the most important point of all. What do you think? Why wouldn't Amazon follow this strategy, especially since it helps eliminate competitors, leads to market dominance and fixes the loss-leader problem they currently have with many ebook sales? The Third Industrial Revolution (The Economist) -- A number of remarkable technologies are converging: clever software, novel materials, more dexterous robots, new processes (notably three-dimensional printing) and a whole range of web-based services. The factory of the past was based on cranking out zillions of identical products: Ford famously said that car-buyers could have any colour they liked, as long as it was black. But the cost of producing much smaller batches of a wider variety, with each product tailored precisely to each customer's whims, is falling. The factory of the future will focus on mass customisation--and may look more like those weavers' cottages than Ford's assembly line. Hiring Executives (Ben Horowitz) -- I am going to meditate for a while on Consensus decisions about executives almost always sway the process away from strength and towards lack of weakness. Facebook Numbers -- On average, Facebook earned $1.21 on each of its users this last quarter. I'd love to be able to pay them $10/yr and have them work for me instead of for [insert best-fit advertiser here]. Information Technology and Economic Change -- research showing that cities which adopted the printing press no prior growth advantage, but subsequently grew far faster than similar cities without printing presses. [...] The second factor behind the localisation of spillovers is intriguing given contemporary questions about the impact of information technology. The printing press made it cheaper to transmit ideas over distance, but it also fostered important face-to-face interactions. The printer’s workshop brought scholars, merchants, craftsmen, and mechanics together for the first time in a commercial environment, eroding a pre-existing “town and gown” divide. They Just Don't Get It (Cameron Neylon) -- curating access to a digital collection does not scale. Should Libraries Get Out of the Ebook Business? -- provocative thought: the ebook industry is nascent, a small number of patrons have ereaders, the technical pain of DRM and incompatible formats makes for disproportionate support costs, and there are already plenty of worthy things libraries should be doing. I only wonder how quickly the dynamics change: a minority may have dedicated ereaders but a large number have smartphones and are reading on them already.